For most of us when we get a craving, it’s for sugar. Whether for a quick “pick-me-up,” a mid-afternoon treat, a late-night indulgence or –yep– that time of the month, something sweet surely makes the top of the list! Even at birth, babies prefer the taste of sweet over any other. Why does this happen? Sugar stimulates the release of the body’s “feel good chemical” serotonin, which calms and relaxes us. However, after eating the bag of jelly beans, this feeling of immense pleasure quickly plummets as your insulin level increases and hustles the sugar into your cells, ultimately dropping your blood sugar. And then the craving rebounds, and you want more sugar! If you are one of these people who constantly craves sweets, you may want to consider how often you indulge. Think about it. We have all heard people say “I’m just not a dessert person.” This is because they don’t regularly eat sweets. On the contrary, those who are “regular sugar-cravers” consume more than their fair share. Simply put, the more you eat, the more you crave. The problem with sugar is not when you have an occasional sweet food, but when you eat excessive sugar. And that is easy to do as sugar is added to many processed foods, including bread, yogurt, juices, cereals and sauces. FYI: According to a report from the 2005–10 NHANES (National Health and Nutrition Examination Survey), Americans eat about 20 teaspoons of added sugar a day . Teens and men consume the most added sugars. Average daily consumption for men: 21 teaspoons, boys: 23 teaspoons, women: 14 teaspoons, , girls: 18 teaspoons. 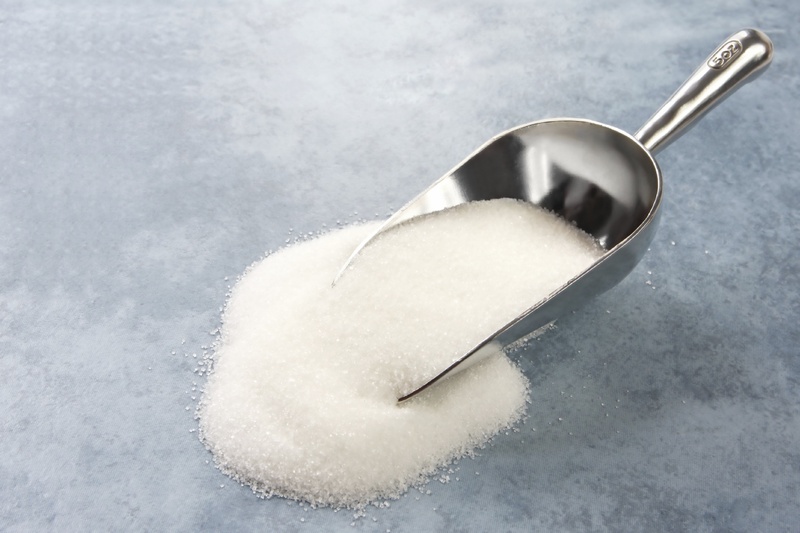 The American Heart Association recommends limiting added sugar to about 6 teaspoons per day for children and women and 9 teaspoons per day for men. Next time you pick up a candy bar, pay attention to how you feel after you eat it. How is your energy level? Are you truly satisfied or still hungry? Are you craving more? When trying to adapt to a healthy way of eating, it can be a “real eye-opener” if you just take a few minutes to observe how your body feels and the cues it’s providing. So what can you do to satisfy your sweet tooth without overdoing the sugar? Have no fear! Your sugar cravings can be controlled. The key is to be mindful when choosing sweets. Have a variety of go-to sweet snacks that won’t break the calorie bank. When you have a craving for sweets, sometimes you can find ways to not give in. Going for a walk, a relaxing cup of Chai tea or picking up a good book can take your mind off the need for a sweet. But when that fails, you need a backup plan! 1. Choose fruit. The healthiest “hands-down” sweet food is fruit. If a sweet dish of pineapple, strawberries, mango, or other fruit will do the trick, this is truly the best choice. You will get a nice burst of energy, but due to the fiber your blood sugar will be more stable and not drop quickly. Keeping fresh or frozen fruit always available is a great way to feed your sweet tooth and stay on track with your healthy eating routine. 2. Keep to your meal routine. Eating every three to five hours throughout the day will help keep your blood sugar stable and decrease your urge for the sweet stuff. Enjoying a serving of fruit with each meal will further decrease your sweet tooth and keep you energized. 3. Combine your sweet with a healthy protein, such as nuts or low fat cheese, or complex carbohydrate, such as fruit or whole grain cereal to avoid the spikes and plummets that leave you wanting more. Maybe fresh fruit by itself doesn’t do the trick! But what if it’s dipped in chocolate? YUM!! Buy a bag of chocolate chips (milk chocolate or dark–whatever your preference!) Cut up a cup of your favorite fruit. Measure out 2 tablespoons of chocolate chips (which is 130 calories) and microwave it for 30 seconds. Sit down at the table and dip the fruit into the chocolate. Or make a trail mix with 1/2 cup Multigrain Cheerios, 1 tbsp. chocolate chips and 1 Tbsp. chopped walnuts. Very delicious and under 220 calories! 4. Feed your craving! Enjoy what you crave, instead of denying yourself. Just try to keep to a sensible portion and eat it slowly! Its smart to limit snacks/treats to 200 – 250 calories. If you feel the strong desire for a candy bar or M&Ms, go for the small size but always read the label. The small package of M&Ms is 250 calories. If you keep them in freezer, you may find that even just a small handful of frozen chocolate will make you quite happy! Better yet, go for a KIND bar. These bars have several chocolate varieties, weigh in at 200 calories each, are a good source of fiber and only 1 teaspoon of sugar. Try to feed your craving with something that will satisfy you so you don’t continue eating. Try a small handful of nuts mixed with a tablespoon of chocolate chips. Or a sweet granola bar with an apple or small banana. 5. Go out and move. When you feel a sugar craving coming on, put on your sneakers and go out for a walk. Doing something else that will relax you may take your mind off the craving. Or, if it’s late at night, sip a cup of soothing chamomile tea with a teaspoon of honey or sugar to feed your sweet tooth and relax. Lisa Stollman, MA, RDN, CDE, CDN was recently honored as the 2015 Outstanding Dietitian of the Year by the New York Academy of Nutrition and Dietetics. She loves traveling the world and experiencing new foods and cultures. Lisa is the author of the ebook The Trim Traveler: How to Eat Healthy and Stay Fit While Traveling Abroad (Nirvana Press 2014) and The Teen Eating Manifesto: The Ten Essential Steps to Losing Weight, Looking Great and Getting Healthy (Nirvana Press 2012).. Lisa maintains a nutrition practice in NYC and Huntington, Long Island where she specializes in weight management, diabetes and travel nutrition. Lisa is also the CEO of Eat Well Restaurant Nutrition where she collaborates with chefs to get healthy dishes on the menu. For more info on Lisa, visit here.